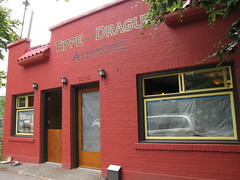 The Tippe and Drague as it looked in July, before opening. Photo by Wendi Dunlap. The Tippe and Drague neighborhood pub at 3315 Beacon Ave. S. opened for business this afternoon. When we went by to check it out, there was a cheerful crowd within ordering beer and food, and watching football on TV. The kitchen won’t have a fryer, so the menu consists of sandwiches and salads, including a very evil grilled peanut butter and Nutella sandwich (with optional bacon). There is also fresh popped popcorn—the popcorn machine was formerly installed at the Columbia City Cinema. You can see the beer list on their website. Owner Melissa told us that the pub has hired several Beacon Hill neighbors as staff, so the business has not only brought food and drink to the Hill, it’s also brought a few jobs. 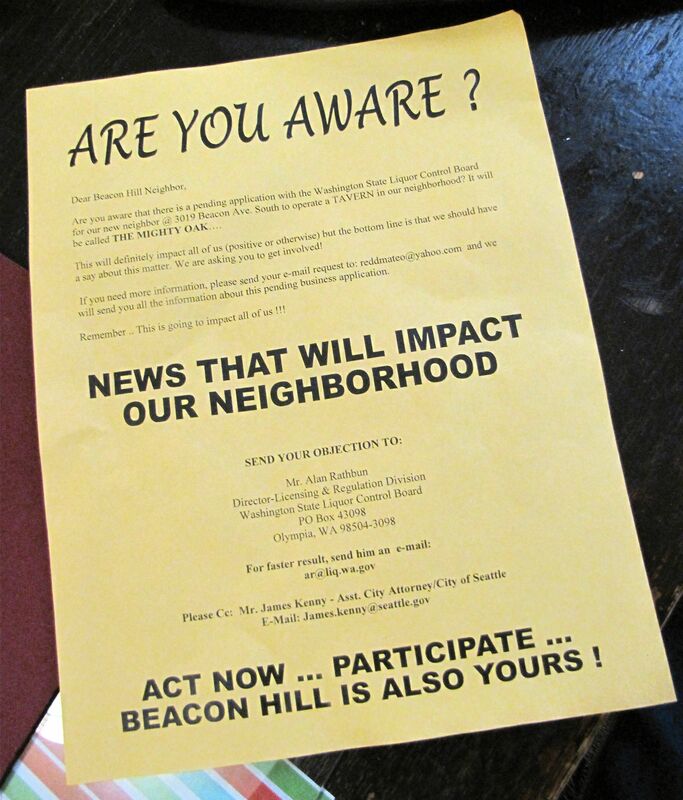 This flyer recently appeared on doorsteps near the location of the planned new bar/restaurant, The Oak. 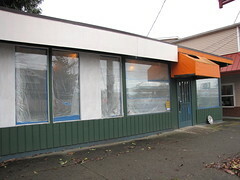 The letter also alleges “chronic illegal activity (Per RCW 66.24.010) associated with the applicants operations of the premises proposed to be licensed AND the applicant’s operation of another licensed premise.” The letter then describes circumstances at the owners’ other establishment, The Redwood, back in 2006 when the bar had newly opened and had problems with some of its neighbors on Capitol Hill, who complained about noise and filed a zoning complaint with the Department of Planning and Development (DPD). However, The Redwood’s case with the DPD has been closed since 2007 and the business is still operating at the same location on Capitol Hill. 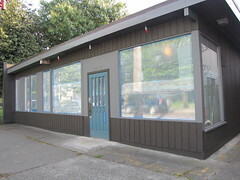 Other allegations in the letter include statements that the Oak’s owners have worked on the property without permits and were issued a violation, and that representatives of the Oak “informed neighbors that the applicant was opening up a coffee shop (but) on February 6 the applicant posted a liquor license application notice.” According to the DPD website, there was a complaint and violation last month, but the Oak’s owners have also received two permits since that date. Lewis’ letter also brings up the 2008 shooting at the Beacon Pub, limited parking in the area, and a “known drug area at nearby Triangle Park” (Stevens Place Park) as additional reasons to object to the Oak’s liquor license application. Some Beaconians have been morning the loss of The Beacon Pub, the dive bar formerly located at the site of Bar del Corso. Perhaps the new liquor license application we saw today will give you hope. 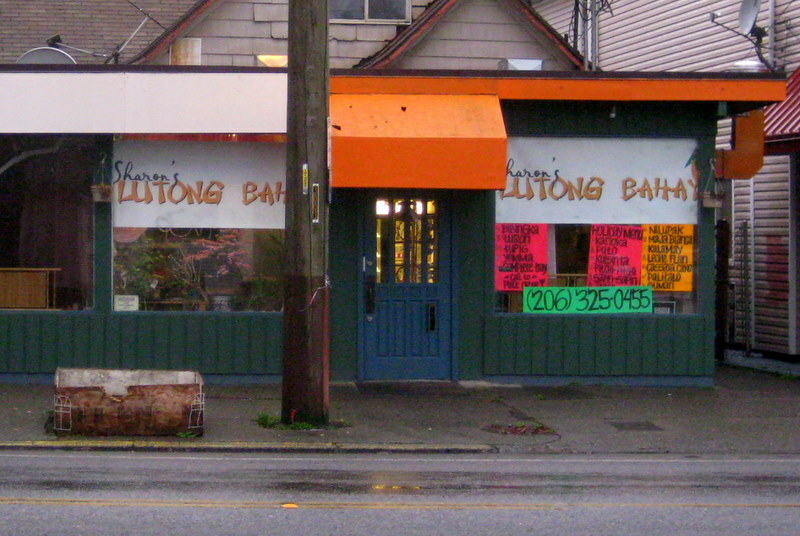 A “spirits/beer/wine restaurant lounge +” application has been filed by Bar4 LLC (Tim Purtill, Kelly Staton, Lisa Jack, and Mat Brooke) for a business named The Mighty Oak, to be located at 3019 Beacon Ave. S. This is the former location of Sharon’s Lutong Bahay and of Manila Video; the building sold a few weeks ago for $435,000. A liquor license of this type allows an establishment with more than 50% dedicated dining business to sell spirits, beer, and wine by the serving for consumption on the premises; the beverages may be sold on tap or in opened bottles or cans. Some years ago The Redwood was under scrutiny after some of the bar’s neighbors complained about noise. (The Redwood, like The Mighty Oak, is located in a mostly residential area, though one that is considerably denser than North Beacon Hill.) The Department of Planning and Development has since closed the complaint case, and The Redwood continues to operate. We are attempting to contact the Bar4 LLC folks and will update when we hear more information about The Mighty Oak. The liquor license application is number 408904. Comments about the application may be e-mailed to the Washington State Liquor Control Board at customerservice@liq.wa.gov.